I found my plums at peak ripeness, falling off a tree in North Berkeley. Yours might come from the store. My jam was extra-tart from the fruit I used, but your may be sweeter. Taste your fruit, and add lemon juice and sugar accordingly. An easy, four-ingredient plum jam. Place 4 or 5 stainless steel spoons in the freezer. Add lemon juice. Place the pot over medium heat, stirring occasionally to prevent scorching. The jam should foam and bubble in about 15 minutes. Continue to cook until the foaming subsides, another 15 minutes. Then, stir in the vanilla if using. Cook the jam another 5-15 minutes until glossy. Total cook time should be anywhere from 30-45 minutes. My smaller batch came out around 30 minutes. Towards the end of cooking, test the jam every few minutes for doneness. 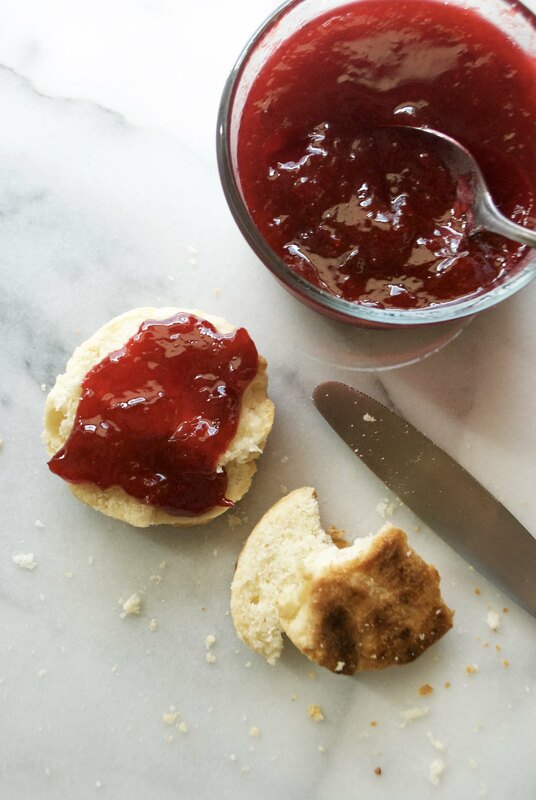 Place a small, dime-sized dollop of the jam onto one of the cold spoons from the freezer. Place the spoon back in the freezer for a few moments. Once the jam is cold, tilt the spoon to see if the jam runs off. When the jam stays put, with minimal runniness, it is done and ready to be canned or cooled and refrigerated. Adapted slightly from the Rich Red Plum Jam Recipe from Serious Eats and The Blue Chair Jam Cookbook.